Multiple sources concur that almost everything we know about Augustine of Canterbury comes through Bede (673-737), a monk and a scholar. The purpose of Bede’s Ecclesiastical History of the English People, 730, is to show how the Church brought unity to England, ending an era of violence and barbarism. Bede, seeing himself as a direct beneficiary of Augustine’s mission, knew from his own experience the struggle among the warring kingdoms. The Romans’ occupation of Britain three centuries earlier had introduced Christianity to the British Isles, but when the Roman forces withdrew, invasion by the pagan Anglo-Saxons forced the Britons to the forests and hills of Scotland, Ireland, and Wales, places to which they withdrew to avoid assimilation by the conquering tribes. In England, within a mile or so of the shores of Kent, the crumbling walls of the ancient Roman fort of Richborough still stand and the beach where Augustine allegedly first met Aethelberht is preserved beneath the rolling turf of, appropriately, Saint Augustine’s Golf Course, owned by the Dean and Chapter of Canterbury Cathedral. . . . The city of Canterbury itself is still surrounded by its Roman wall for nearly half of its perimeter, following the same boundary that was familiar to the first missionaries. Saint Martin’s Church, dedicated by Queen Bertha on a hillside overlooking the city and still in a remarkable state of preservation, continues as the oldest place of worship continuously in use in England. The people, the land, and the Church attest to the witness of Augustine of Canterbury. The daughter and granddaughter and great-granddaughter of Methodist ministers (from the English Church), as I seek to be faithful and to follow God’s leading, the English Church for me is the path I follow. I am indebted for my faith and the faith of my ancestors to Augustine of Canterbury, on whose feast day, May 26, I wrote this tribute. 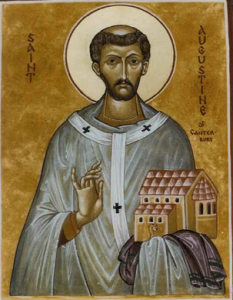 Perhaps we, like Augustine of Canterbury, may commit ourselves to seeking peace among warring tribes, pointing to the One who transcends all time and space. Mary is my longest-running online friend. We met over C. S. Lewis and Elizabeth Goudge. Greetings from a former Methodist, Mary. This is a very fine piece. As a member of the Ordinariate for former Anglicans, Sts. Gregory the Great and Augustine of Canterbury are important names to me. In fact the little Ordinariate group I'm in, which is unfortunately barely clinging to life, is called the Society of St. Gregory the Great. I'm sorry I haven't had a chance to comment on this, or anything really, for a while. I attend a church named for St. Gregory for about 14 years, and I have always loved him because when I read his writings in the Office of Readings, they always seem as if they had been written, not in some dusty long ago past, but recently. They are as pertinent now as they were then. 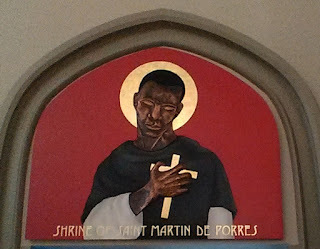 I must have read about Augustine in Bede, but that was many years ago, and I don't remember much.